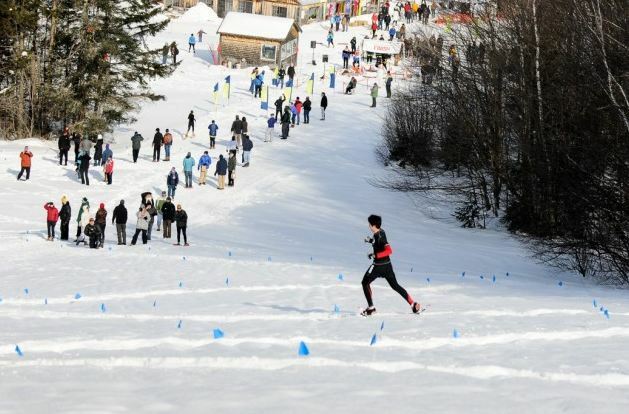 Bennington, Vt. was the central location of this year’s Dion National Snowshoe Championships, right in the heart of Dion Snowshoes’ territory. The bright orange and white of the Dions was hard to miss, as a lot of racers were wearing them, but then again that would be a given as this was the biggest National Snowshoe Championship in history, as more than 400 people from 18 different states (and several more countries) competed in the 14th running of the big event (run Feb. 28 through March 2). The race was held in Woodford, roughly 15 minutes from Bennington, a little further up Prospect Mountain – an altitude that was more than 2,200 feet compared to the 600 or so feet above sea level that Bennington is (photos in article courtesy Scott Mason). It was perhaps the “easiest” championship race course that the national competitors have seen in the last five years, but that didn’t mean it was a walk in the park by any means. The course was still very challenging, thanks to more than 1,200 feet of climbing (according to the author’s Garmin watch) during the 10-kilometer race, mostly all during the first half of the race – shortly after the 5-kilometer mark, the downhills dominated the rest of the race action. There was plenty of single-track, a good portion of it between the beginning of the second mile and the next two kilometers that followed, but later in the race the longest section of single-track (four-tenths of a mile) existed inside the fourth and fifth miles. 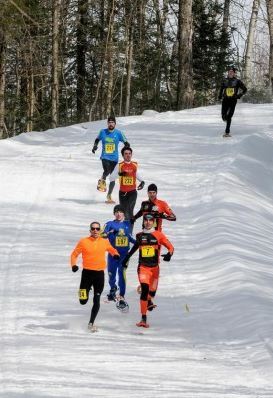 For the most part, the course was hard-packed and only soft in some of the single-track sections, allowing for some of the fastest times that the National Snowshoe Championships has ever seen. There was plenty of snow on the course, thanks to a very long and cold winter that saw a lot of heavy snowfalls – the temperature on this day ranged between 15 and 25 degrees Fahrenheit, not too cold and almost perfect except for some wind that lowered the windchill temperature by about ten degrees. It was still comfortable enough for spectators thanks to the sun being out most of the day, and racers may have been warm unless they dressed in their lightest layers. The Juniors 5K event was the first to break in the course for the day at 9 a.m., and then the Seniors Women 10-kilometer championship event broke from the line at 10 a.m. The women had the race course stomped down well and the course had minimal breakup (softness) when the Senior Men started at 11:30 a.m. Last year because of the warmer conditions, the course was pretty damaged and a lot slower by the end of the day, but thankfully circumstances set up better this year in Woodford. Later in the day a Citizens race took place, bringing in even more racers, with an uphill challenge event also on the books for the weekend. The 10K championship course was great for spectating in the early section, as during the first mile they got to see their favorite racers weave by on the course three times before disappearing into the woods traversing up Prospect Mountain. The audience did have to wait awhile (maybe forty minutes or more) until they saw their beloved competitors again, but it was exhilarating near the finish as racers zig-zagged down the steep hill towards the finish just after they came into view again. In the final two to three minutes of their race, a deafening crowd cheered on the racers as they curved around some trees and then around a final finishing loop that climbed a small hill and went back down again quickly to the finish line. The course fluctuated between 2,200 and 2,700 feet above sea level, with almost constant climbing from the beginning of the first mile through the end of the third mile — there were several single-track sections in the second and third miles of the race, all short enough in length that passing was not a problem because the course opened back up to open ski trail again after about a minute of running the narrower section. Anyone that excelled on hills was definitely superior here, especially the elite racers that run mountain challenge events in the summer and fall. No matter what shape you were in, your quads were likely screaming in pain as you were getting closer and closer to the summit spent with the hard effort needed to stay with your competition. Finally around the 5K point the downhills were seen again, and there were some parts where one could really build some momentum on the descents. On one long single track section though about 4.5 miles in, it was downhill but momentum was slowed because of the switchbacking and soft nature of the narrow single-track. There were still some small hills mixed into the second half, but nothing that took more than about 15 seconds to climb before going back down again. At the end it opened up to that zig-zagged section that gave the crowd the pleasure of viewing before the big finish. There were 213 men and 114 women in each of their championship 10K events, the highest numbers ever for Nationals thanks to the east coast (mainly New York state) being the most populous and most competitive between elite runners and triathletes converted into snowshoe racers in the country. Vermont itself didn’t have the greatest representation (except for the Dion athletes of course) but the surrounding New England states showed up well. It must be noted how well the Midwest (Minnesota, Iowa, and Wisconsin) represented themselves really high in the standings, with three of the top five and four of the top seven Americans from the men’s race being from these states. Because of the area of the country and continent this was, it invited individuals of several different foreign countries to the affair, and these folks tended to be on the fast side – the top two overall men were actually from Canada. The other countries, more remote, that represented were Spain, Great Britain, Sweden and even Brazil, Mexico, Australia and Puerto Rico. There were around twenty competitors that came from outside the United States – this is an elite event indeed that is getting more prominent every year, inviting more and more international competition. 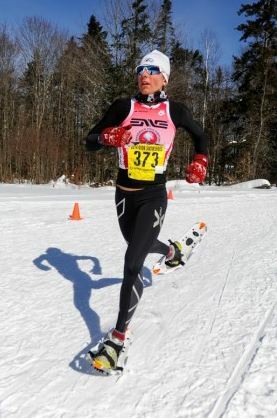 New this year for the National Snowshoe Championships was the three-person team competition, which was simultaneous with the championship events. This was a great idea by the event committee, as nearly every racer ended up participating on a team – the top three racers from each team counted towards the team standings, which added up the times for these members and compared them to the other teams for rankings and awards. There were over a dozen teams formed in both the men’s and women’s races – another very competitive aspect of the weekend. Also, the annual Sunday morning relay race (four-person teams with each team member running approximately 2.5 kilometers each) took part seeing a record number of teams – 24, in which nearly every team medaled in either an open, mixed, masters, or other class. 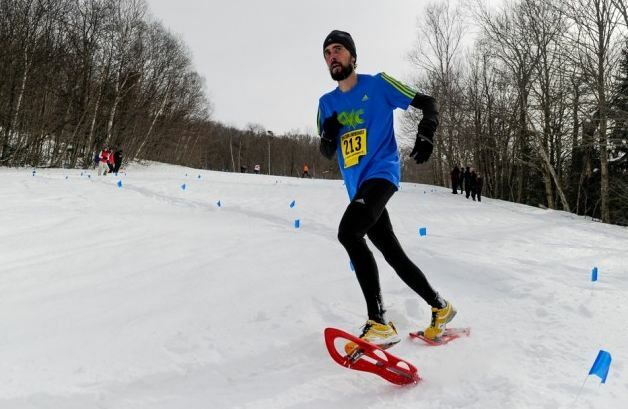 It was announced during a reception ceremony on Friday night in Bennington that the National Snowshoe Championships would be back in Wisconsin in 2015 (they were in Cable, the northwestern part of the state in 2011), and would this time be in Eau Claire. 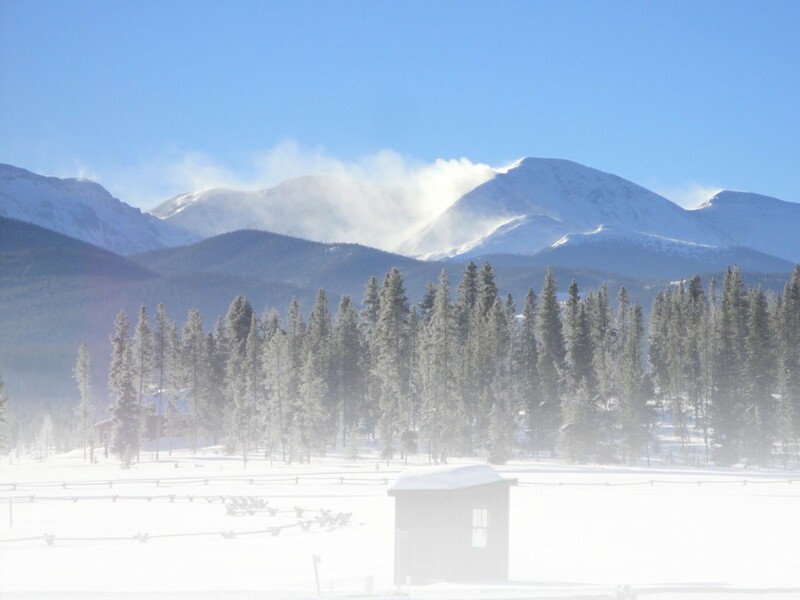 The site would be at the grounds of Lowes Creek County Park, a large 250-acre park run by the Chippewa Off Road Biking Association – they currently host a race called the Powder Keg Snowshoe race (a 5-mile and a 2-mile), this year held on Feb. 8. 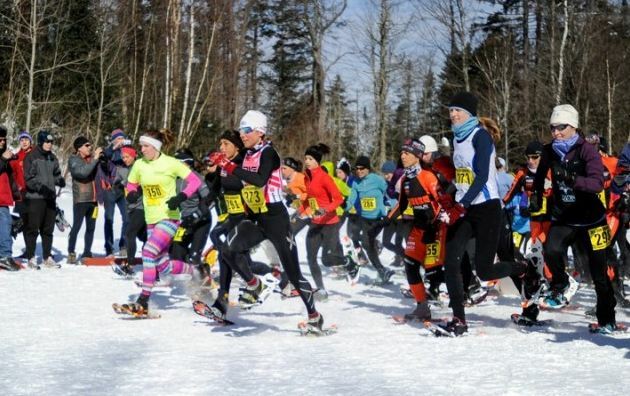 Next year that race will be prep for the biggest snowshoe race in the country, where the midwest will host again the most competitive snowshoe event in the nation, on the picturesque single-track cliffs and ski trails of Lowes Creek County Park in Eau Claire, Wis. The Vermont competition will not be forgotten though, as the heart of Dion country will forever be in the hearts and minds of the most competitive athletes that snowshoeing has ever seen. 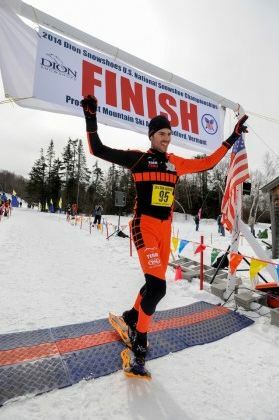 Additional information and results of this race are available at http://www.snowshoeracing.com/national_championship14.htm and http://ussnowshoechampionships.com/. See more United States Snowshoe Association information at www.snowshoeracing.com.